We just wrote about Nokia announcing ultra low cost mobile phone in India in near future that would roughly cost you Rs. 500/-. Vodafone UK, however, have beat them to it – Although not exactly Rs, 500 phone, they have launched world’s cheapest mobile phone in the market. The Vodafone 150, which was unveiled at Mobile World Congress in Barcelona, will sell for “below $15” (approx. Rs. 700/- ) and is aimed at the developing countries like India, Turkey and few African nations. I had guessed that such low cost, the phone would be bare basic, probably just the calling / SMS facility with a phonebook and it is exactly that ! Did you expect anything more than that? BTW, it has Polyphonic ringtones….Sweet ! Even the battery is superb with a standby time of more than 10 days. I can tell you for sure that these ultra-low cost mobile phones will be a huge hit in Indian rural markets. Just think what these kind of mobile phones will do to to poor farmers who probably do not have any access to outside communication at-least for few kilometers radius from where they live ! Here is the Patrick Chomet of Vodafone giving a brief demonstration of the Vodafone 150. 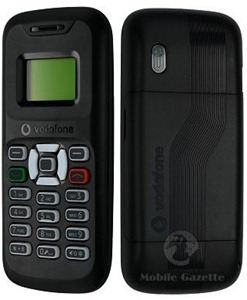 "Vodafone Launches Lowest-Cost mobile phone, beats Nokia to it ! ", 5 out of 5 based on 1 ratings.